Passionate and headstrong, rich and kind, impulsive and beautiful, Madame Tallien was very much a product of her time, and lived her life to the full, doing what she pleased without caring what other people thought about her. Born Juana María Ignazia Teresa de Cabarrús y Galabert in Madrid on the 31st July 1773, she was the daughter of a rich aristocrat and Spanish finance minister. Theresa (as we’ll call her from now on) was very close to her father, who spoiled her rotten and instead, never felt much love for her mother. 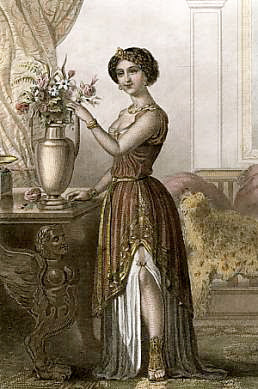 Therese’s fortune, together with her good looks and lively personality, attracted many suitors to her hand. At only 14 years of age, she married the unattractive and mean Marquis de Fontenay, a counsellor of the Parliament of Bordeaux. After the marriage, the Marquis de Fontenay insisted on leaving Spain and brought his wife to Paris, where she threw herself into the fashionable life of the time. She even went to court where she was introduced to Queen Marie Antoinette. Her marriage however was a disaster. Her husband dissipated her fortune, constantly cheated on her (it is said that he brought one of his lovers to his home only days after his wife had given birth to her first child, although it’s not certain he was the proud father of the infant! ), and abused her. When the French Revolution broke out M. De Fontenai, tired of his wife and fearful for his life, divorced Therese (but not before he demanded she gave him all her jewels) and left the country. Here Jean Lambert Tallien, a representative of the people and a national commissioner, saw her and struck by her beauty, fell in love with her. He managed to get Therese released, which caused him to be recalled to Paris to explain his actions to the Committee of Public Safety. Theresa never liked Tallien. He had voted for the King’s death and had committed many acts of cruelty during his mission as a representative of the people. Despite this, she returned to Paris with him and agreed to marry him out of convenience. Thanks to her lover, in fact, Therese managed to get other state prisoners released. It is said, but how true this is isn’t certain, that Theresa played an important part in the fall of Robespierre. Apparently, Theresa would later tell people that it was a letter she had managed to send to Tallien, in which she accused him of being a coward for not helping to prevent her trial and her subsequent execution, that prompted him to bring about the fall of Robespierre the very next day. True or not, a grateful Therese, married Tallien on the 26th December 1794. Shortly afterwards, she gave birth to a daughter christened Thermidor Tallien. Now that the Terror was over, Paris rejoiced. Therese became the leader of fashionable society. She went out every night scantily dressed in muslin gowns, with nothing underneath, but covered in diamonds, rubies, sapphires and other precious stones, and wearing pink and gold wings on her head. When she wasn’t dictating fashions, Therese helped those who were still prisoners, which gained her the nickname of Notre Dame des Thermidor. Her husband Tallien was ordered to empty the Parisians prisons, which were still full to the brim, and through him, Therese obtained the release of many state prisoners as well as securing a safe return home to the emigrees. The marriage, which had been one of convenience, didn’t last long. She could never love nor admire a man who had committed so many acts of cruelty and when, in 1795, he had 950 Royalists soldiers who were sill prisoners shot, she didn’t want anything to do with him anymore. “He has too much blood on his hands”, she said, disgusted. However, the couple didn’t divorce straight away. As Tallien was sent to Egypt, Therese began a series of affairs with different men. Among her lovers were numbered the Count de Ribbing, a Swedish nobleman nicknamed the Beau Regicide for the part he had had in the murder of the Swedish King Gustavus III, and from whom she had a son, Paul Barras and Gabriel Ouvrad. Napoleon Bonaparte was said to be enamoured with her too, but she spurned his advances and instead presented him to her friend Josephine. Instead than being grateful to her for it, Napoleon banned Josephine from seeing her again because of her loose morals ( she had children – ten in total – with different men and two or three husbands still living). Josephine, however, would secretly sneak out to meet her and the two would remain friends for the rest of their lives. When Tallien returned in 1801, Therese asked him for a divorce. At first he refused, complained, reproached and threatened her but the next year, he finally gave in. 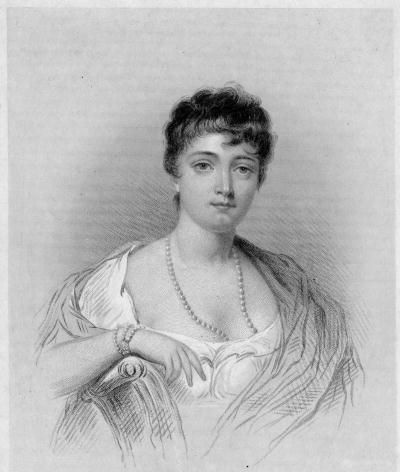 After her divorce, Therese met and fell in love with the Comte de Caraman, later Prince de Chimay. The two were married on the 22nd of August 1805 and had three children. Therese’s life had now gone full circle: she was back in the class she had been born in. At Chimay, her husband’s seat, she held a little court, inviting famous musicians of her time such as Luigi Cherubini and Daniel Auber. 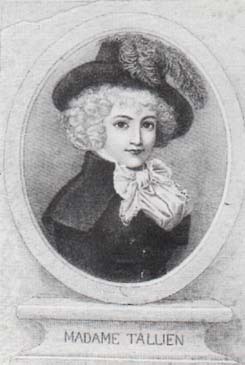 Therese died in Chimay on 15 January 1835.